Ella Spremulli proudly displays her CLSC Young Readers medallion and certificate. She received the awards from the CLSC Veranda for reading 16 books from the program’s historic list. The vast vocabulary and thoughtful sentences spoken from 11-year-old Ella Spremulli’s lips defy her youth. Her favorite activity is to thank for her intelligent personality: reading. 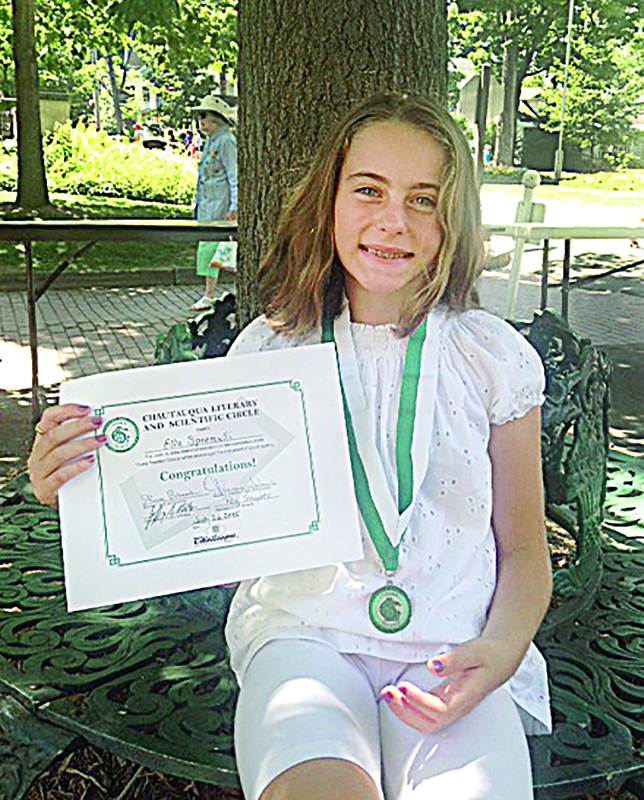 While she may have re-read her favorite book, The Fault in Our Stars, many times, she’s read enough books to put her on this year’s list of recipients of the Chautauqua Literary and Scientific Circle Young Readers Medallion Award. Children who read 16 books from the CLSC Young Readers historic book list, including Chautauqua: An American Utopia by Jeffrey Simpson, are eligible for a Young Readers Medallion Award. The award recognizes dedicated young readers with a certificate and a medallion — made possible by the donations of the John Bliss Memorial Fund and the CLSC Class of 2002. As of Monday, Ella is one of nine young readers who were awarded with a certificate and a medallion this year. Nathan Reeder, Clay Hershey, Owen Weismann, Lauren Russell, Jane Potee, Vivienne Potee, Kara Enright and Nathalie Borden were also recipients. Pam Spremulli, Ella’s mother, said although reading is something both she and her husband enjoy passionately, it’s a love Ella has discovered on her own. The family lives in Chagrin Falls, Ohio, and Spremulli grew up in Lakewood. Pam’s parents are CLSC graduates, and she’s trying to get her local book club to graduate together — they’ve got about nine books under their collective belt so far. Each summer, they return to Chautauqua for a few weeks, and the Young Readers program is something that came naturally to Ella and her 8-year-old sister. Mary Pat McFarland has worked at the CLSC Veranda for five years. As a K–12 reading specialist in Pennsylvania, she considers herself a matchmaker of sorts. The level of interest she sees in young readers is inspiring, and she’s happy to pair them with selections from CLSC lists. The books are carefully chosen to be appropriate for young readers, but also challenging in vocabulary, theme and content. A lot of readers are advanced, and parents might not want their 9-year-old reading teen literature, she said. Families in Chautauqua are known for being fervent readers, McFarland said, and they pass this on to their children and grandchildren. Peg Snyder, manager of the CLSC Veranda, said awarding kids with the medallion is a highlight of her job. The smiles are huge and the kids are always happy to have their picture taken with their awards, she said. Matt Ewalt, associate director of education and youth services, said the Young Readers program is meant to serve as a bridge to the CLSC. While Ella’s younger sister insists on reading the same book over and over again, Ella knows reading different books and genres is important.